1. inside addresses that will be translated. 2. a pool of global addresses. Unlike with static NAT, where you had to manually define a static mapping between a private and a public address, with dynamic NAT the mapping of a local address to a global address happens dynamically. 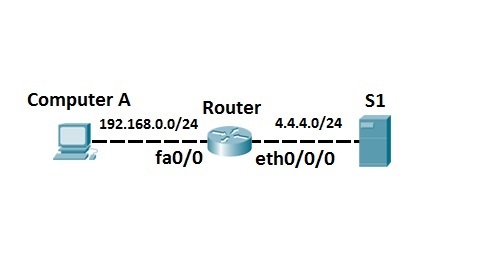 This means that the router dynamically picks an address from the global address pool that is not currently assigned. It can be any address from the pool of global addresses. The dynamic entry stays in the NAT translations table as long as the traffic is exchanged. The entry times out after a period of inactivity and the global IP address can be used for new translations. Computer A requests a web resource from S1. Computer A uses its private IP address when sending the request to router R1. Router R1 receives the request, changes the private IP address to one of the available global addresses in the pool and sends the request to S1. S1 responds to R1. R1 receives the response, looks up in its NAT table and changes the destination IP address to the private IP address of Computer A. The access list configured above matches all hosts from the 192.168.0.0/24 subnet. The pool configured above consists of 5 addresses: 4.4.4.1, 4.4.4.2, 4.4.4.3, 4.4.4.4, and 4.4.4.5. The command above instructs the router to translate all addresses specified in the access list 1 to the pool of global addresses called MY_POOL. In the example above, you can see that the private IP address of Computer A (192.168.0.2) has been translated to the first available global address (4.4.4.1). You can remove all NAT translations from the table by using the clear ip nat translation * command.